I got a trial size of this lipstick for 100 points at Sephora. As many of you probably know, Sephora has a Beauty Insider program when you get a point for each dollar you spend at their store. 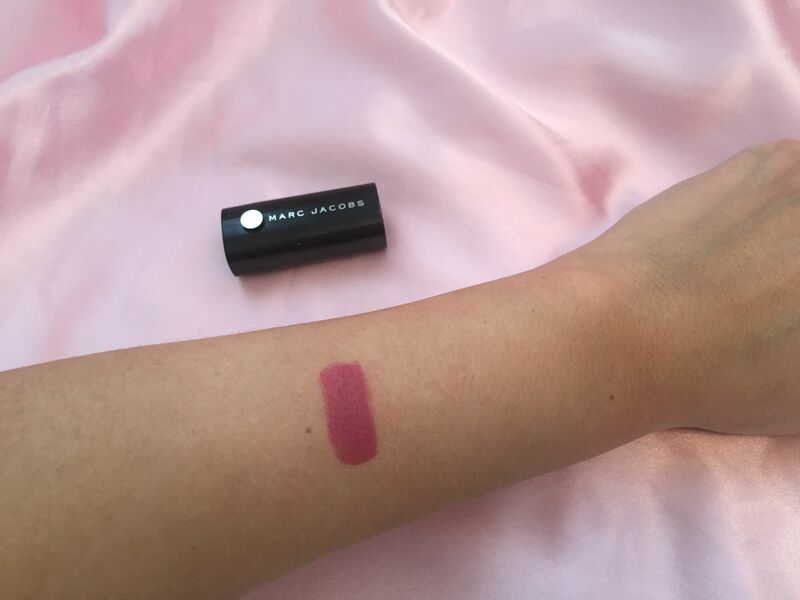 Marc Jacobs just recently introduced Le Marc Lip Crème line of lipsticks and I was excited to try one of them without actually buying it. For a long time I was a bit suspicious about Marc Jacobs beauty products because the company got into the beauty industry only 2-3 years ago. Some time ago I bought Marc Jacobs blush and I didn’t find anything particularly great about it. 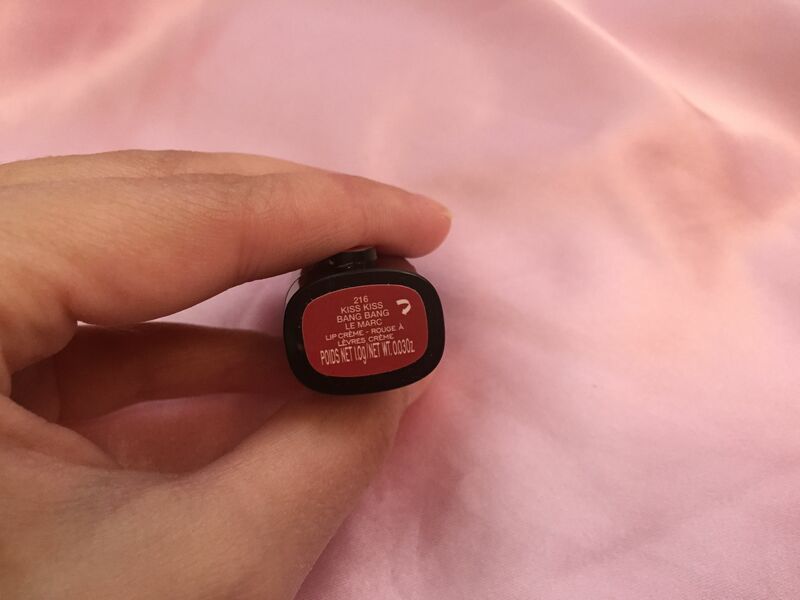 The little baby lipstick (0.03 oz.) that I got came in Kiss Kiss Bang Ban 216 color which is described as “baked rose”. It’s probably one of the most popular colors in this line. It came out recenty but is already out of stock on Sephora. I am sure it will be back though – it looks like everybody wants it. It truly is a beautiful shade of rose – dark, saturated and vivid. This color is matte (the whole line is if I remember correctly) so do not expect any shine or glitter. 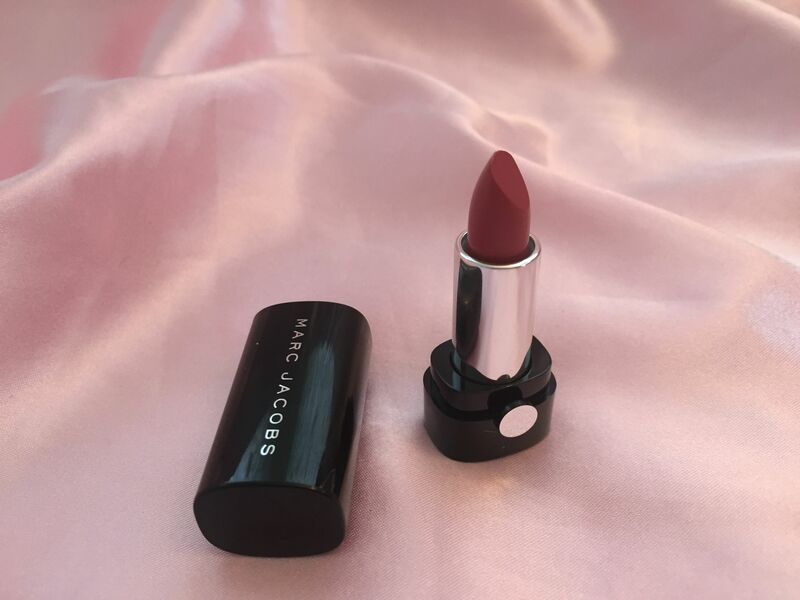 The color and texture of Le Marc strongly reminds of a limited edition lipstick by Givenchy (Le Rouge 207 Rose Pumetis) that I own. I love my Givenchy lipstick and I am happy that Marc Jacobs came up with a product that strongly resembles it and is not limited edition. Le Marc Lip Crème line of lipsticks description promises “endless hours of luxurious wear”, “unprecedented color payoff” and “ultimate long-lasting color and moisture.” Well, let’s talk about each of these promises individually. I tried the lipstick for about 4 or 5 times and I can say that yes, if you don’t drink and/or eat, the color will last for a few hours (3-4 to be exact) without smudging and fading. If you do drink (I am not even talking about eating), the color will most definitely fade within a couple of hours. So, 10 hours of wear promised by Sephora and Marc Jacobs is a delusion. During the day I had to re-apply this lipstick quite a few times. I am not saying it’s necessarily a problem (most high-end lipsticks fade pretty quickly) but I just don’t like crazy exaggerations and false promises. Okay, I totally agree with this one. Marc Jacobs managed to create a color which while being muted and classy is at the same time very rich and saturated. The color payoff would be my one major reason for buying this lipstick. I feel pretty awesome wearing it. By the way, although Kiss Kiss Bang Bang stays my favorite color in this line, I also really like Je T’Aime 238 (it’s a bit more saturated than Kiss Kiss Bang Bang 216) and Boy Gorgeous 222 (berry rouge). Both complement my complexion and hair color. I already talked about how long the color lasts, therefore I would like to discuss moisturizing effects of this lipstick. Unfortunately, I did not find this lipstick creamy and nourishing. On the contrary, it felt quite drying. I had high hopes for it when I read that my lips will feel “plumped and nourished” and was disappointed with reality. I have extremely dry lips and therefore usually avoid high-pigmented lipsticks with a stain effect because long-lasting color is almost always accompanied with drying effect. 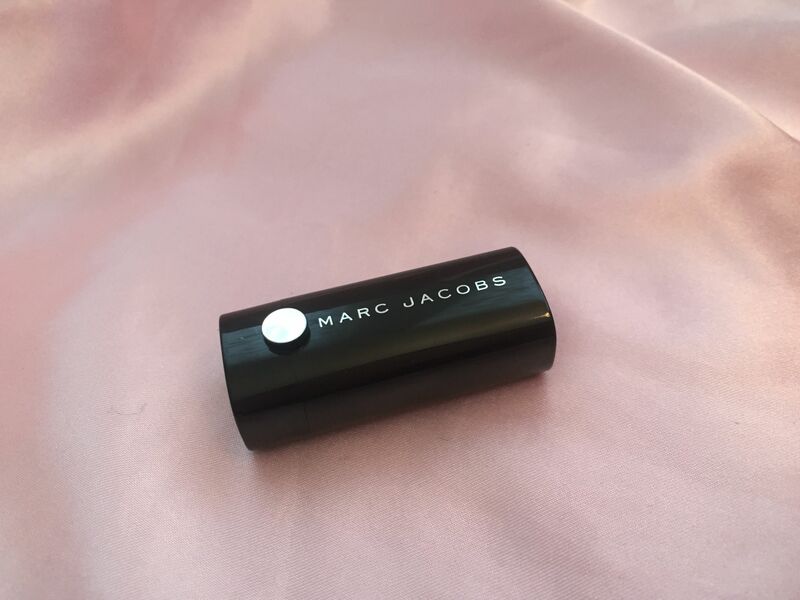 Le Marc Lip Crème lipstick definitely felt like one of those – when I was wearing it I found my lips to be drier than usually. 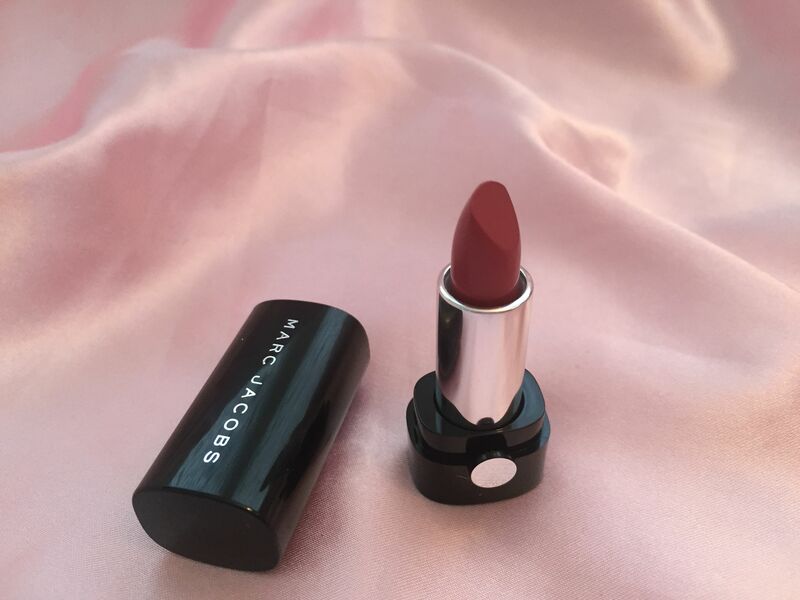 Despite its name (Lip Crème), this lipstick doesn’t stand even close to lipsticks by Guerlain or Dior – those truly are luxuriously creamy and make my lips feel like they are in heaven. It’s hard to talk about packaging since I got a mini version but I did like a magnetic clasp – it is cute and convenient. A simple black case is appealing too although I can’t say I find it dashing. Overall, I would say that despite all my complaints I would probably still buy a full-size Kiss Kiss Bang Bang lipstick: I do love the color. However, if I find something similar but with actual moisturizing effect by other brand, I’ll skip Le Marc Lip Crème. Please note that since I hadn’t actually bought this lipstick, I didn’t rate its “Good Value”.